Q: What is the liquor policy at Elkhorn? A: You can buy beer, wine, and some hard liquor at the ranch. Historically guests have enjoyed social hour on their porches with family and/or other guests. You may purchase alcohol in the dining room and are welcome to take it back to your cabin or drink it with your meal. Q: Will I need a car at the Elkhorn? A: Many people find that they have plenty to keep them happy at the ranch. However, you'll want a car if you'd like to explore the area, including Yellowstone Park and Big Sky, or fish in a variety of areas. The Elkhorn provides transportation to and from either the Bozeman airport or the West Yellowstone airport at the beginning or end of your stay with us. Q: How can I be reached when I am at the Elkhorn? A: There are no phones or televisions in the cabins, but phone, fax and wireless internet are available in the office. Many guests comment on how relaxing it is to be separated from the “real world” at Elkhorn. Thankfully, there is no cell phone service at the ranch. 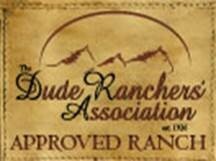 Along with USPS delivery, both UPS and Fed Ex deliver to the ranch if you need to send or receive anything. Q: Do I need cowboy boots to ride? A: Yes, but you don't need to own a pair! The Elkhorn has a huge supply of lenders that you are welcome to use. In the interest of both safety and comfort we ask all riders to wear slip-on cowboy boots. Lace-ups and hiking boots increase your chances of being hurt. Q: Can my under 6 child ride? A: Rather than going on trail rides, children under six get introduced to Montana horseback riding by doing pony rides around the ranch. This allows younger children the chance to learn to enjoy riding and love horses in shorter increments. “Pre-nuts” usually have meals with the Peanuts (ages 6-12) and spend time with them when they are at the rec hall and around the ranch. Q: What is the temperature at the ranch during the summer? A: Of course it varies but these are the averages: June (Avg. High 68, Avg. Low 36) July (Avg. High 78, Avg. Low 41) August (Avg. High 76, Avg. Low 38) September (Avg. High 64, Avg. Low 30). Q: What is the best month to come to Elkhorn? A: June often has the best wildflower viewing but late snows or rain along with high-mountain snow can limit rides to the highest peaks. Fishing is usually better later in the summer when the high water recedes. July is great for wildflowers and green meadows. You'll probably see young deer and elk. The fishing is good. Late August brings a hint of fall as the first snows dust the highest peaks, pushing the wildlife and big game down where you're more likely to see them. Crisp, clear days fill September and the aspens explode with color. You'll also see more elk and begin to hear them bugling. Q. Does Elkhorn supply riding helmets? A: We don't lend helmets because integrity and fit are important to safety. You may come with your own or purchase one once you get here.